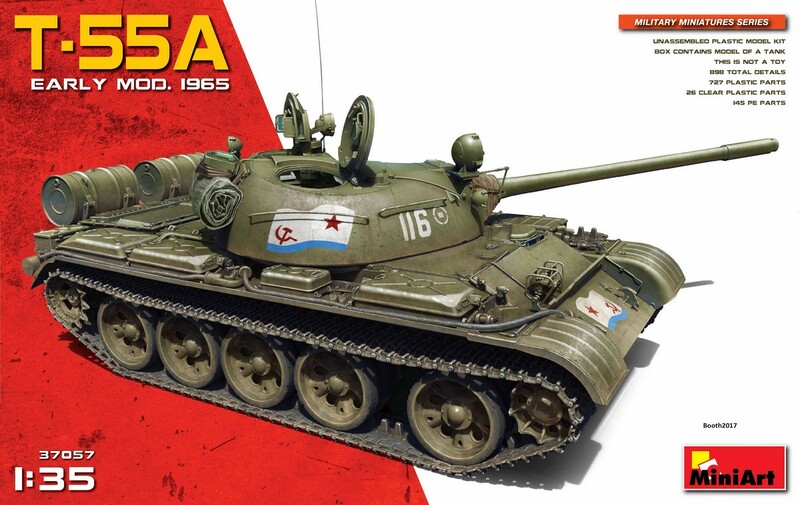 Recently received from Miniart in Ukraine is their 1/35 T-55A early Mod 1965. In the packed (and rather heavy) box you get 69 sprues moulded in grey styrene, a single clear sprue, a sheet of etch packed separately in a cardboard envelope and a decal sheet. One feature Set of the kit. Some 753 plastic parts are included along with 145 etched ones and this isn’t even the version with a full interior! 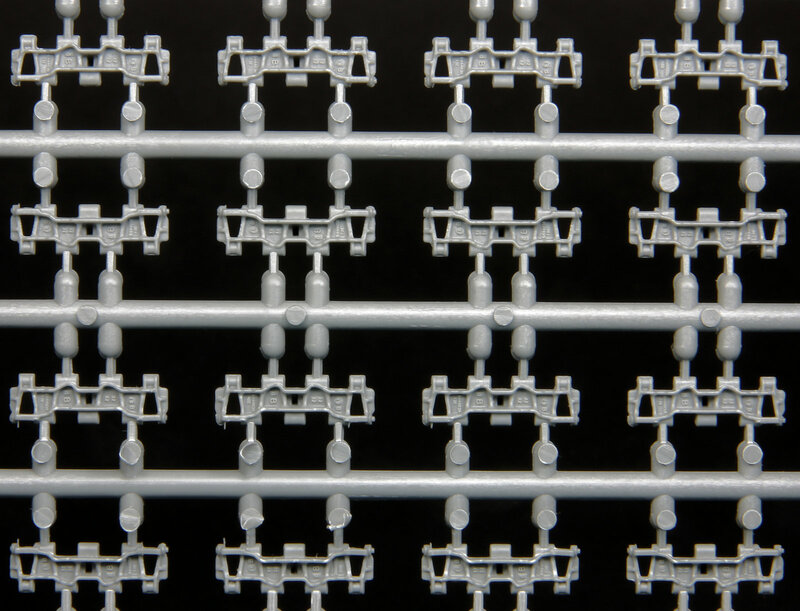 Admittedly there are 90 track links each side and around 80 or 90 parts that are not required but that still leaves over 470 parts to stick on the model and the reason for this is the amount of detail that Miniart has provided which I shall get to in due course. 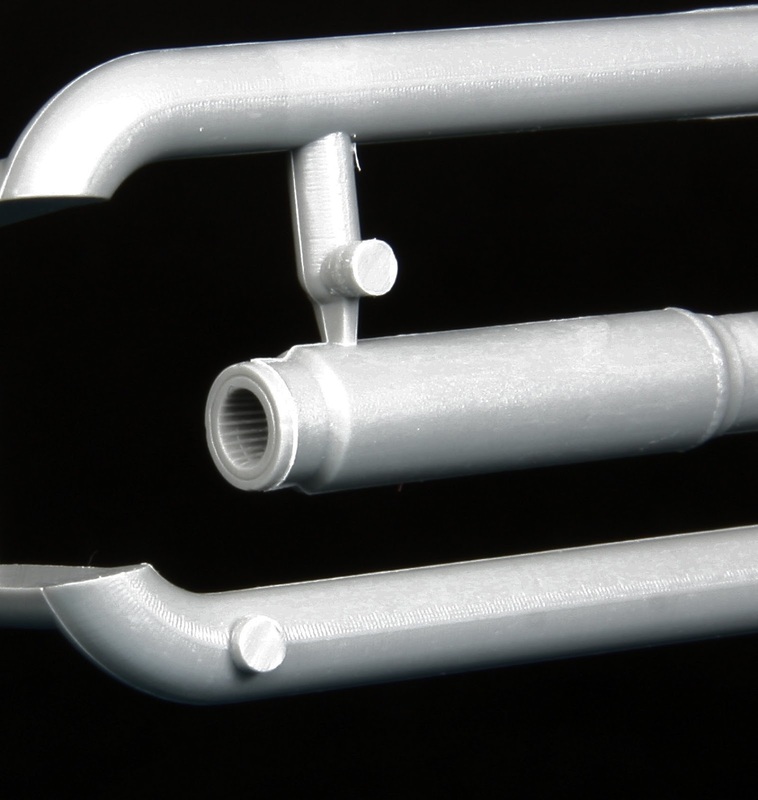 Moulding quality is good although there is some flash in places such as the road wheels and engine deck grill and moulding pin marks here and there but these are mainly confined to hard-to-see areas. 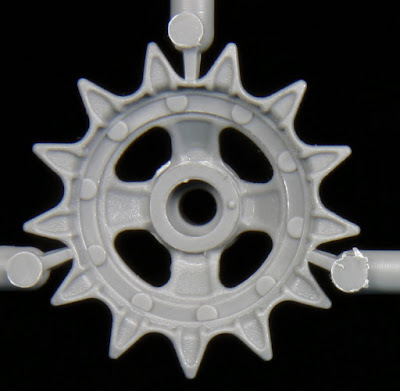 Seam lines are present too but you would find them in any injection-moulded kit. 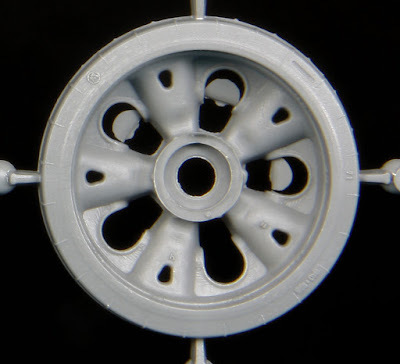 Removing the road wheels will be tricky due to where they attach to the sprues as they feature a raised tread pattern with a seam around the centreline and this could be very easily destroyed during clean up. 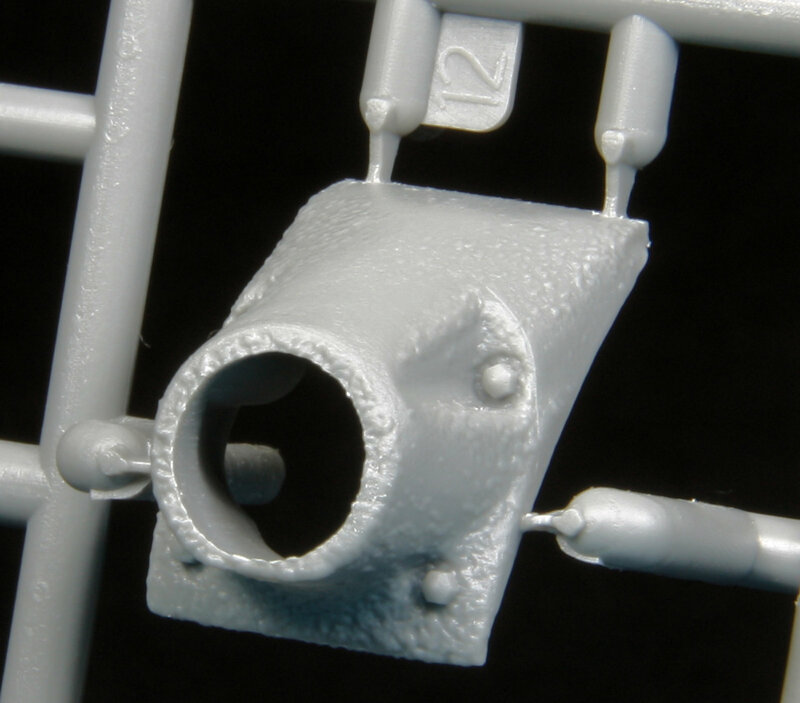 I would recommend using heat-stretched sprue or very thin diameter styrene rod to replace it should this happen. Moving on to the detail and here Miniart scores very highly in my opinion as every track link features casting numbers and letters on the outer face, the main gun is a one-piece item (slide-moulds) and the end of the barrel features very fine rifling and something I’ve only ever seen on aftermarket metal barrels. 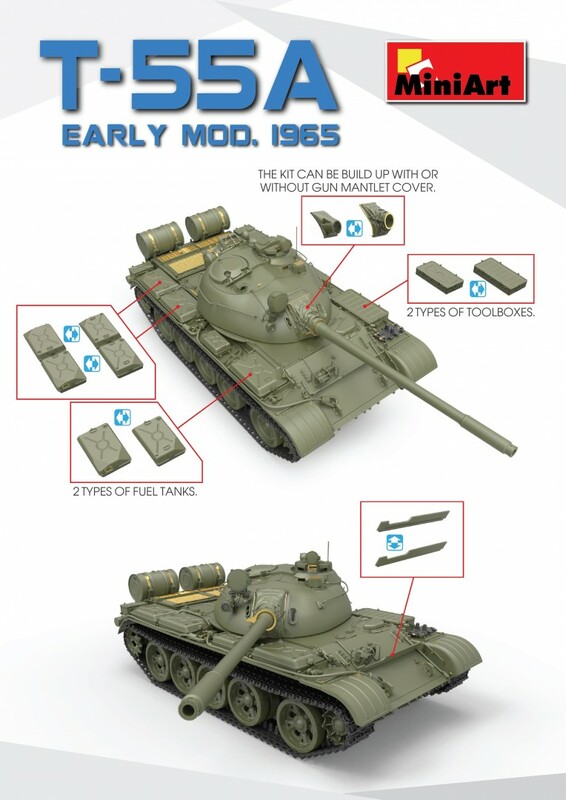 You have two options for the gun mantlet with either a canvas cover or one without and this will be very useful for modelling some T-55’s during the conflict in the Balkans as some of these didn’t have the cover. The fuel lines that connect the exterior fuel tanks together before entering the hull are provided however looking at these I would probably replace them with wire and use the plastic parts as templates as these are liable to break during clean-up. The fenders feature some detail underneath in the form of stiffeners rather than the usual blank faces and photo-etch strips for the front mudguards are included. 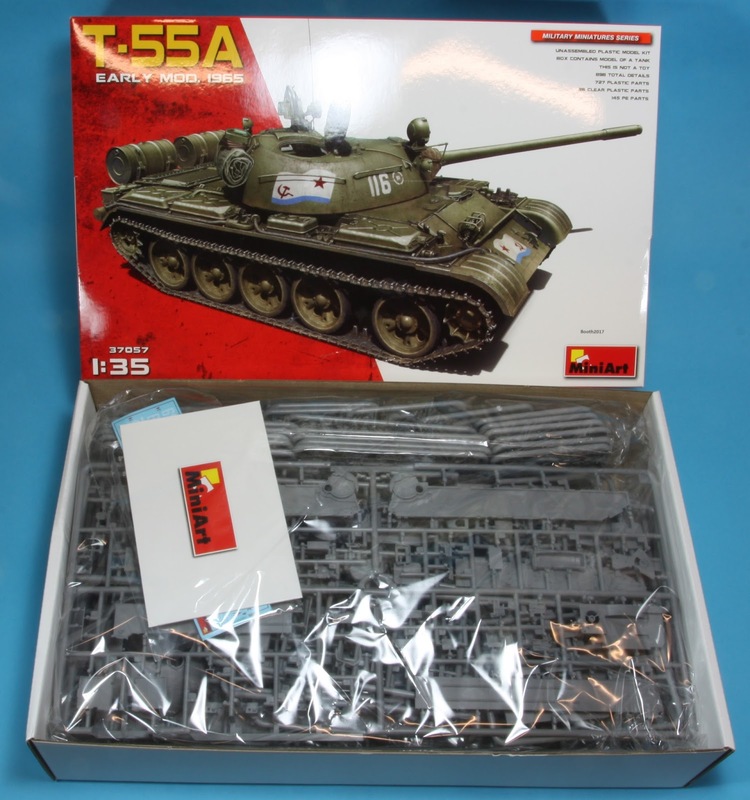 Although this kit is not the version with the interior detail you still get some for the turret in the form of periscopes, vision blocks and sighting devices plus detail on the inside of the hatches. 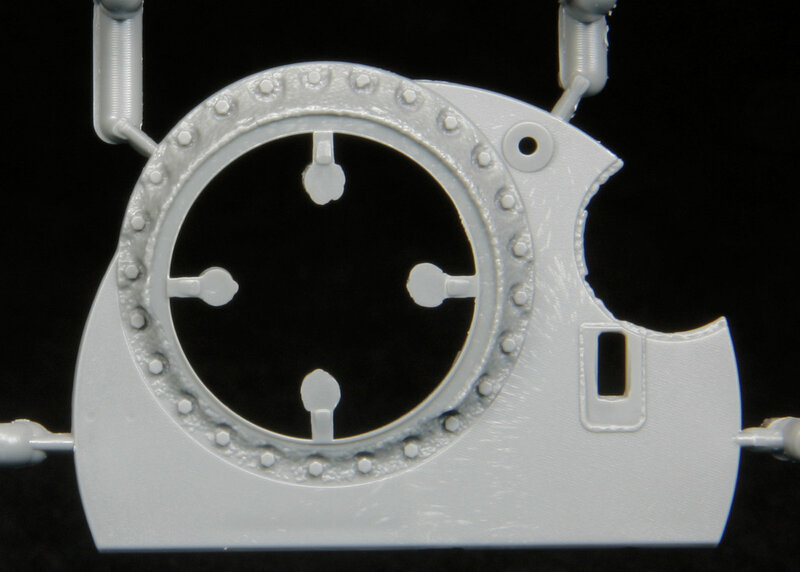 There is also some detail for the hull interior such as an ammo rack, side walls and rear bulkhead and the kit feature a workable torsion bar suspension which is handy if depicting your model on uneven ground. You have the option of whether or not to have the fittings on the front hull for mine clearing equipment, however, you need to check the painting instructions at the rear of the instruction booklet as to which of the options had them. Other options include early and late fuel tanks, a choice of two types of lid for the stowage box on the left fender and a drivers windshield and hood that can be posed in position on the drivers hatch or stowed on the rear turret, again check the painting instructions as to which option belongs to which vehicle. 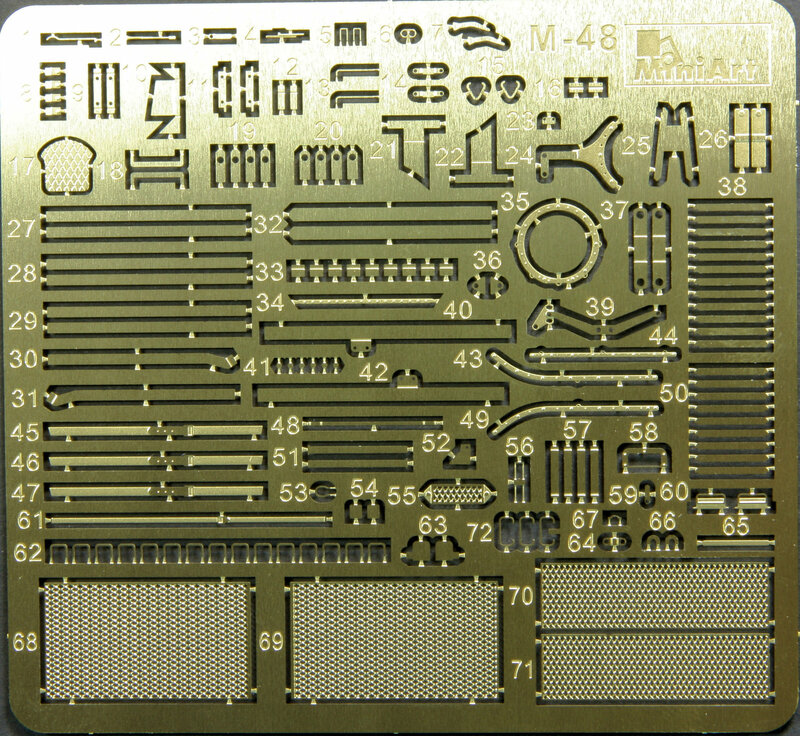 The etch set has all the grills and enough detail included without going over the top so to me there is really no need for aftermarket etch with this kit. 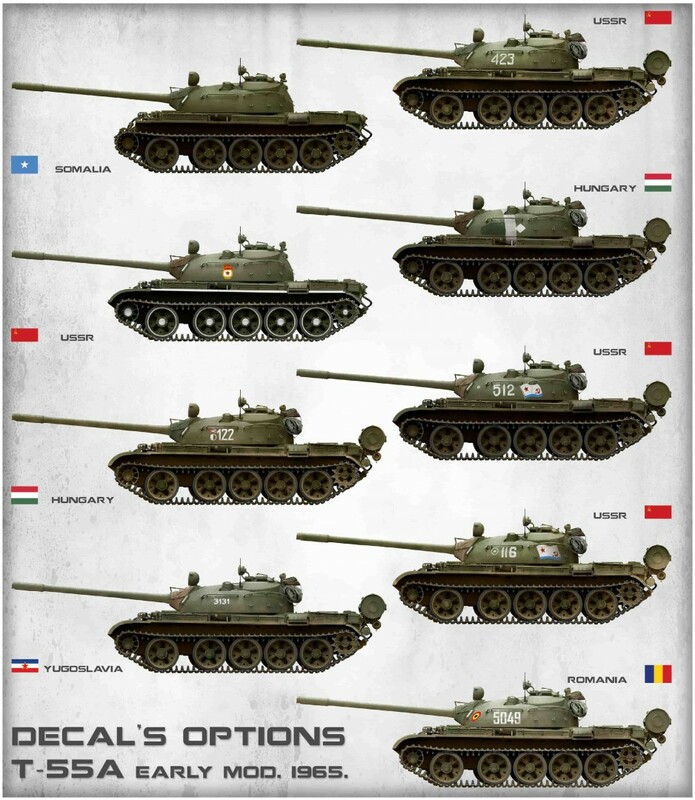 You get nine painting and marking options that span four decades of T-55 use, mainly in Soviet markings for marine and army vehicles, however, there are options for Romanian, Somali, Hungarian and Yugoslavian ones too, the Romanian vehicle having a two-tone scheme of green and grey while the rest is overall green. The decals are printed in Ukraine by Decograph and seem to be well printed and in register. Overall, I’m impressed by the level of detail included in this kit, things like the separate bolts that hold the tow cables in position on the right fender, photo-etch bolt heads to add on the rear fuel tank brackets just add to the completeness of the model without resorting to the aftermarket. The only nit-pick I have would be the use of etch for grab handles on the three later type fuel tanks and tie-downs on the rear turret as Photo Etch is flat in profile so I’ll replace these with fuse wire. Other than that, this looks to be a great kit so seeing that I can’t get all those sprues back in the box I suppose I’d better get on with building it. Many thanks to the guys at MiniArt in Ukraine for sending me the kit. 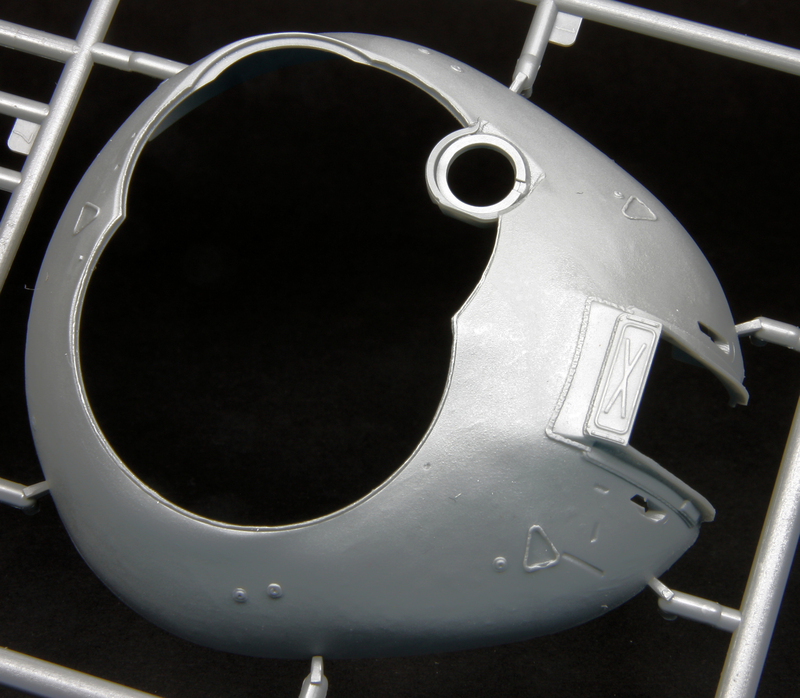 The build has started – so stay tuned for more on this kit on TMN.